1 INFORMATION KIOSK: Before you leave the airport, look for the newcomer welcome center. The Toronto Pearson International Airport has the Immigrant Reception and Information Services (IRIS) kiosk and the Vancouver International Airport has the Community Airport Newcomers Network(CANN) kiosk. 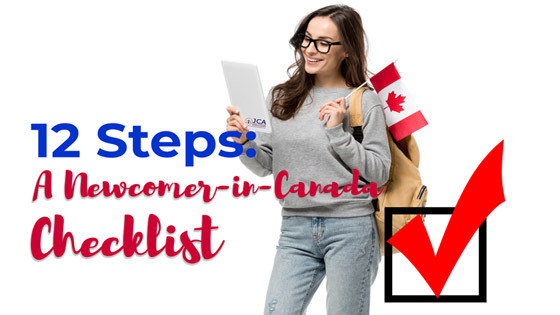 These kiosk machines will have pamphlets and resources to help you in your first days in Canada and these brochures are very helpful especially to the newcomers like you. 2 PLACE TO STAY: Find temporary accommodation for your first few nights after landing in case you don’t have relatives and friends here in Canada. If you plan to stay longer, look for a comfortable place to stay where establishments are accessible like transportation, hospital or clinics, schools, and supermarket. 3 MAP: Obtain a good street map, a telephone book, and the Yellow Pages. These resources will be important tools in your first days as you get to know your neighborhood. Search out local services in case phone services are not yet available during the first few weeks. 4 COMMUNITY CENTERS: Look for community services like non-profit organizations. They offer free services for the newcomers especially those that are government funded. You may avail the free ESL training, settlement counseling, employment workshops and more. They also often have host programs that buddy up newcomers with volunteers who guide newcomers through their first few months in Canada. 6 SIN: Apply for your Social Insurance Number (SIN) card. Without it, you cannot get a job or apply for any government assistance or credit. Applications for a SIN card can be made through a Services Canada office. 7 OHIP: Apply for your Ontario Health Insurance Plan card (OHIP). Application forms for these cards are available from doctor’s offices, hospitals, and most pharmacies, or by calling the provincial medical services authorities. Since there is a three-month waiting period for coverage in Ontario, don’t delay in your application. Apply for temporary health insurance to cover your family during the waiting period. 8 BANK ACCOUNTS: Open an account at a bank or credit union near your home. It’s important to start a relationship with a bank as soon as possible, so you can manage your money, pay your bills and begin building a credit history. Most banks are offering bank accounts for newcomers without any bank fees. Some other banks require start-up deposit. 9 MOBILE PHONE: Get a cell phone. Sign up for a Canadian cell phone, even just a pay-as-a-you-go type plan so you will be accessible for potential employers and landlords. Once your residency is secured, you could apply for a better post-paid plan. 10 DRIVER’S LICENSE: Get your Canadian driver’s license. An international license is only valid for a few months. If you plan to stay for a short period, you could use your driving license for 90 days. If you are staying longer than 90 days, you need to apply for International Driver’s Permit (IDP) and it is valid up to 1 year of stay. 11 SCHOOL: Enroll your kids at school. Every child between the ages of five and 16 is entitled to, and in fact required to, attend school. Inquire at schools in your neighborhood or contact the local school board for guidance. 12 FURNITURE: Buy essential furniture and household items. Look for inexpensive options like buying second-hand items at garage sales in your neighborhood. Sometimes, your neighbors are giving it for free. You may see it outside of their garage or sidewalks. You may also try Furniture Bank.